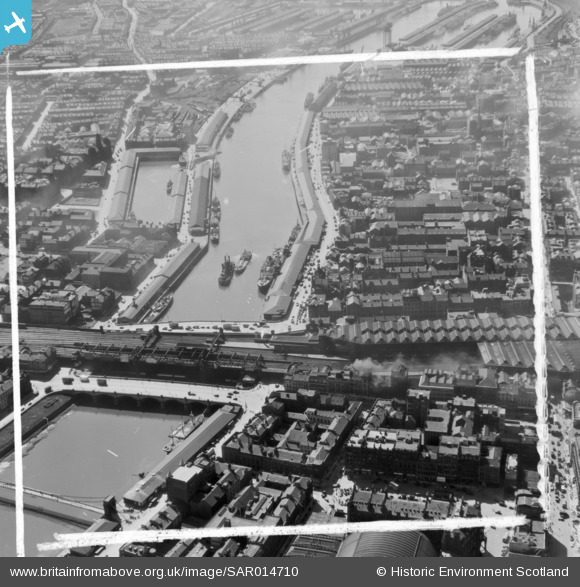 SAR014710 SCOTLAND (1951). Glasgow Bridge to Kingston Dock Glasgow, Lanarkshire, Scotland. An oblique aerial photograph taken facing West. This image was marked by AeroPictorial Ltd for photo editing. Title [SAR014710] Glasgow Bridge to Kingston Dock Glasgow, Lanarkshire, Scotland. An oblique aerial photograph taken facing West. This image was marked by AeroPictorial Ltd for photo editing. Paddle Steamer at the Broomielaw. Finnieston Ferry, The Vehicular Ferry Finnieston crossing from Mavisbank Quay to Finnieston, c 1890s. The 50-ton Finnieston Crane is partly hidden behind the ferry. The Finnieston was built in 1890 and could carry up to eight carts and 300 passengers. It was a double-ended "elevating deck ferry", with an elevating platform deck that could be raised or lowered by steam winches to the level of the landing quays, no matter how low or high the tide. Elevating deck ferries were subsequently introduced at the Govan and the Whiteinch crossings. The Finnieston vehicular ferry service was discontinued in 1966. Glasgow Bridge, Central Station Bridge on the left. Irn-Bru billboard. Irn-Bru (/ˌaɪərnˈbruː/ "iron brew") is a Scottish carbonated soft drink, often described as "Scotland's other national drink" (after whisky). It is produced in Westfield, Cumbernauld, North Lanarkshire, by A.G. Barr of Glasgow, since moving out of their Parkhead factory in the mid-1990s, and at a second manufacturing site in Mansfield, Nottinghamshire, England. In addition to being sold throughout the United Kingdom, Barr's Irn-Bru is available throughout the world and can usually be purchased where there is a significant community of people from Scotland. Innovative and sometimes controversial marketing campaigns have kept it as the number one selling soft drink in Scotland, where it competes directly with global brands such as Coca-Cola and Pepsi. Johnnie Walker Whisky billboard. Johnnie Walker is a brand of Scotch whisky owned by Diageo that originated in Kilmarnock, Ayrshire, Scotland. It is the most widely distributed brand of blended Scotch whisky in the world, sold in almost every country, with annual sales of over 130 million bottles. Double Diamond Burton Pale Ale billboard. Samuel Allsopp & Sons of Burton upon Trent first brewed Double Diamond in 1876 as an India Pale Ale. Allsopp merged with Ind Coope in 1935. Bottled Double Diamond began to be advertised heavily from 1946, becoming one of four nationally distributed beers by the 1950s. Under reciprocal trading agreements Ind Coope would agree to stock a rival brewer's beer if they replaced their supply of Bass or Worthington with Double Diamond. The keg version was launched in the 1960s. In the 1970s, it was advertised heavily by Ind Coope, especially on TV, with the tagline: "A Double Diamond works wonders". Carlsberg UK discontinued off-trade sales in 2003, although it continues as a keg beer. It has been alleged that small scale production of the bottled variant continues as it is Prince Philip's favourite beer, with Paul Burrell attesting that Philip drank a small bottle nightly. The keg version is currently known as Double Diamond Pale and is 2.8% ABV. Ind Coope Burton Ale (4.5% ABV), a cask conditioned version of bottled Double Diamond first brewed in 1976, is currently produced by Carlsberg UK. Nicholson Gin billboard. J&W Nicholson & Co was a London-based gin maker. The company was founded in the 1730s during the Gin Craze, and was based in Clerkenwell, mideay between the grain mills and milling facilities at Three Mills and the gin palaces in Central London The company stopped making gin in England 1941 and closed its premises Three Mills in 1966.